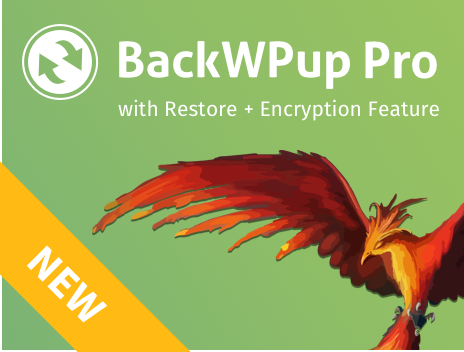 As of January 13th 2017, we only offer BackWPup Pro on our own platforms backwpup.de (for German support) and backwpup.com (for English support). If you have questions please contact as via our contact form or directly at support@backwpup.com. You own a BackWPup Pro license from MarketPress? For the renewal of your BackWPup Pro license, you will receive a 50% voucher via the MarketPress renewal newsletter. With this you can purchase BackWPup Pro on backwpup.de or backwpup.com. You can replace your MarketPress license with the newly purchased license. The plugin files must also be replaced. Please keep the following in mind to keep your current plugin settings. Buy BackWPup Pro and download the zip file to your computer. Unzip the zip file. The unzipped folder is called backwpup-pro. Login to your WordPress installation and go to Plugins → Installed Plugins. Deactivate BackWPup. DO NOT delete the plugin. Via FTP, go to the /wp-content/plugins/ folder of your WordPress. Upload the folder backwpup-pro, which you have unzipped in step 2, to the /wp-content/plugins/ folder. Go to Plugins → Installed Plugins of your WordPress. Maybe you have to reload the page, to see the newly uploaded Pro plugin. Add your license key to receive automatic updates and get support if needed. Thank you very much and welcome to your new BackWPup community!